By default, you initiate metering and autofocusing with your Canon EOS 60D by pressing the shutter button halfway, and then lock autoexposure by pressing the AE (autoexposure) Lock button. 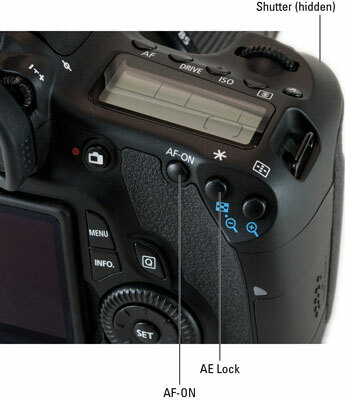 The AF-ON button duplicates the behavior of the shutter button. Set the Mode dial to a mode in the Creative Zone. As with all Custom Functions, you can take advantage of this option only in P, Tv, Av, M, B, or C exposure mode. Additionally, the locking setup you specify applies to only those modes. Display Setup Menu 3, highlight Custom Function IV: Operation/Others, and then press Set. Press the multicontroller right or left to scroll through the custom functions. Stop when you get to C.Fn. IV-1. In this case (similar to adding functionality to the Set button), you see an illustration of the camera back and help text describing the function of each button in question. Press Set to activate the list of settings. A highlight box appears around the setting number (not the illustration). Press the multicontroller left or right or turn the Quick Control dial to activate the option you want. Metering: Meters the scene. When this happens, you see exposure information displayed on the Quick Control screen, in the viewfinder, and on the top LCD screen. 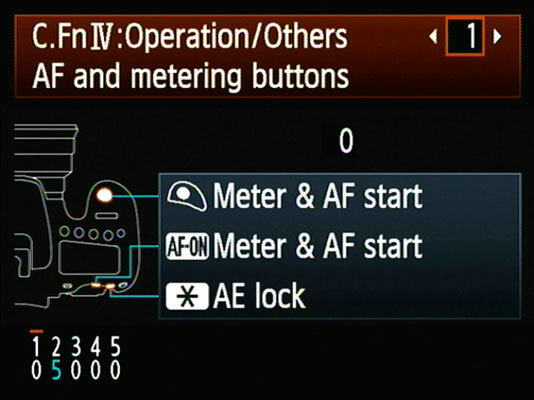 AF start: Initiates autofocus as long as the button is depressed (or pressed halfway in the case of the shutter button). AE lock: Meters and locks the exposure into the camera as long as you hold the button down. No function: This one is easy to explain! It’s just a matter of finding what mixture of functions and buttons that suits you best from among the ten choices. This might take some time to figure out what you like and don’t like about the setting you’re using. Press the Set button to finalize your choice. Now when you shoot in an advanced exposure mode, the camera locks focus and exposure according to the option you selected. In the fully automatic modes, the settings have no effect; you still press the shutter button halfway to focus, and you can’t lock autoexposure.